What exactly does the poster of Schindler's list depict? 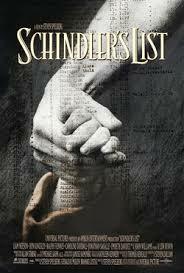 After watching Schindler's List, I had a look over the poster of the movie. I couldn't understand the meaning behind the poster depicting a person holding the hand of a baby. What is the meaning of the image on the poster? I agree with the other persons interpretation that it is Schindler's hand holding / saving the Jews. The poster very accurately depicts the events in the film. That baby's hand represents the Jews survivors and that grown man's hand represent Oskar Schindler himself. This is about how he holds the hand(s) of Jews and ultimately saved them. If you look closely, the poster shows the Schindler's List as well. Saul Bass was asked to design the poster for this film. Eventually, his version consisting of an image of barb wire spiking paper containing the names of the people Schindler saved, was refused. The original film poster looks more hopeful than the rejected barb wire one. The close-up shot depicting the joining of two hands is very powerful, symbolising unity and alliance as the Jewish people cannot make a difference on their own, and the bond between Schindler and 'his jews' is ultimately triumphant as he manages to save thousands of lives. The fact that it appears to be a child's hand joining with an adults could represent the vulnerability of the Jewish people, in the sense that they are almost portrayed and treated like children unable to defend themselves. This vulnerability immediately creates a strong sense of sympathy, as us the viewers want to reach out and help them and see the 'weaker people' triumph. In the background a faded list of names is visible as 'schindlers list'. The fact that the poster has been designed to show names and numbers, rather than faces of the Jewish people could represent how they are depicted throughout the film and in the view point of the majority of Germans throughout this film, as just numbers with no significance or importance and not treated as individuals but instead as a mass work force. The list also emphasises the sheer amount of Jews who have had their human rights stripped and personally the list format makes me feel uncomfortable because of the way it emphasises that so many Jews have been treated this way. The list finally foreshadows latter events, as we discover later in the film that Schindler compiles a list of 'his Jews', the ones that have worked for him in order to save their lives. This poster show what didn't happen in the movie. Schindler didn't rescue the girl in red coat (true story) http://www.auschwitz.dk/redgirl.htm But he did rescue the people on his list (also shown in the poster). The idea is that although Schindler helped a lot of people he could not help them all. But as both lists are long (those who died and those who survived) every death is a tragedy on its own and deserves deep thinking about the horror that is idea of killing helpless kids, women and man. In a book about insurgency in Warsaw Jewish Ghetto "Shielding the Flame", Marek Edelman, one of the last leaders, describes a scene when mother jumped out of the window of a burning tenement (set on fire by SS) holding two kids close to her, and although they died in the same time each one of them died alone. Not the answer you're looking for? Browse other questions tagged analysis posters schindlers-list . 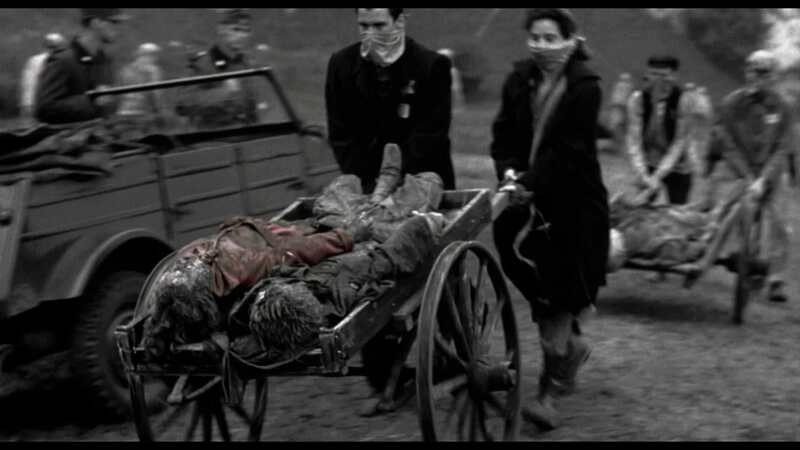 How many times is color used in Schindler's List? What was the significance of the diamond swallowing scene in Schindler's List? How was the red coat in Schindler's List created? Meaning of Gandalf's quote “There never was much hope. Just a fool's hope”? What is the meaning of Enter The Void?